14 week training plan for Athletes training towards Ironman distances. Training time of up to 20 hours a week requires a strong base of fitness, this plan will help you achieve your goals over the Ironman or long distance in Triathlon. Supporting bike session or used on an easy day to help promote recovery. The purpose of this session is to develop aerobic endurance and efficiency. The aim of this session is to run at a comfortable pace. Start jogging easily (L1) for about 5 minutes as your systems wake up. Hold Marathon Intensity (L3) for the rest of the duration of the session. The purpose of this session is to develop your core strength, stability and flexibility. The focus is on functional strength, which will also help prevent injury and allow a solid platform for your limbs to work harder and more powerfully. Ensure that you work at maintaining good posture throughout and keep your breathing controlled. Set your core before each exercise and do not rush. Stretching as required. Take any extra time with a mat to do stretching of key areas you know you find are particularly tight. Ankle Rockers – 10 Reps each side Holding for 3 seconds. Used during Build week to prepare you for the challenging Strength-Endurance work ahead. 300-600m with different stroke to FC every 4th length. Aim to hit every 50m in the same time. 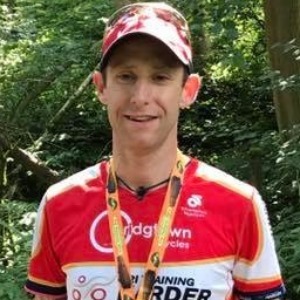 Represented Great Britain Age-Group Team at Sprint, Middle and Long Distance Triathlon and Duathlon at 3 x World Championships and 3 x European Championships, All top 10 Finishes.